We analyze clients’ objectives, use public opinion research to test strategies, draft initiatives that can win voter approval and manage winning campaigns. Mollrich Communications is experienced in creating and producing effective advertising on all media platforms, including television, radio, direct mail, email and the internet. Arnold Forde began using targeted direct mail in the 1960s when billboard and newspaper ads were state of the art campaign media. 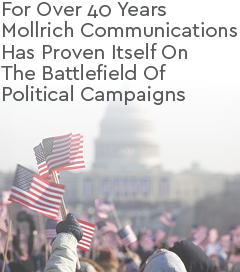 Mollrich Communications remains on the cutting edge of addressable and targeted media today utilizing micro-targeted direct mail, auto-dial and interactive telephone calling, online advertising, email and social media to reach voters in statewide campaigns on a very personal level.